Daneen Skube, Ph.D. is Director of Interpersonal Edge, a firm that gives companies and individuals an interpersonal advantage. She has developed a unique hybrid approach that combine the most powerful interpersonal tools, the best workplace strategies, and the wisest spiritual teachings. Her clients range from CEOs of international corporations to stay-at-home moms. Her expertise is providing clients with tools and a plan for what to do and say to get what they want. Over the last thirty years Dr. Skube has developed a unique hybrid of tools she calls strategic communication. Dr. Skube has worked in the fields of professional speaking, executive coaching, training and counseling for over 30 years. 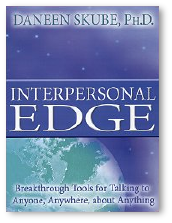 Her latest book, “Interpersonal Edge: Breakthrough Tools for Talking to Anyone, Anywhere, about Anything,” is published by Hay House and can be purchased through this website or Amazon.com. She also writes a popular column, “Interpersonal Edge,” internationally syndicated by Tribune Media. She’s consulted as an expert on communication by the television, print, and radio media. Dr. Skube was recently sought out by CBS and put under a national television development contract. She was also contacted by CNBC to discuss a Suze Orman-style show for workplace advice. She conducts corporate training sessions, coaches executives, does mediation sessions, and maintains a small counseling practice. Dr. Skube has also taught as a lecturer at the University of Washington’s Evans Graduate School of Public Affairs. Dr. Skube has spoken extensively on the Interpersonal Edge at conferences throughout the United States, Europe and Canada. An Innovative and Unique Expert in the Field. Dr. Skube is consulted as an expert on strategic communication by the television, print, and radio media. Her unique national expertise was recognized by CBS, which recently placed her under a six-month development contract. She has also been a regular guest on Northwest Afternoon and KCPQ TV’s morning news. She’s a pioneer in the growing field of web education — coming soon to a computer near you will be an archive of “Workplace Guru” webisodes from Tribune Broadcasting for you to watch. An understanding of the psychology behind breaking news. Strategies for thriving in an increasingly unpredictable work world. Insight into the people side of hot business news: how fear affects consumers, what’s really behind white collar crime, and how to protect yourself from co-workers that may become violent. Negotiation strategies for everything from a promotion to a new job. Advice they can use five times before lunch as they deal with people problems at work.